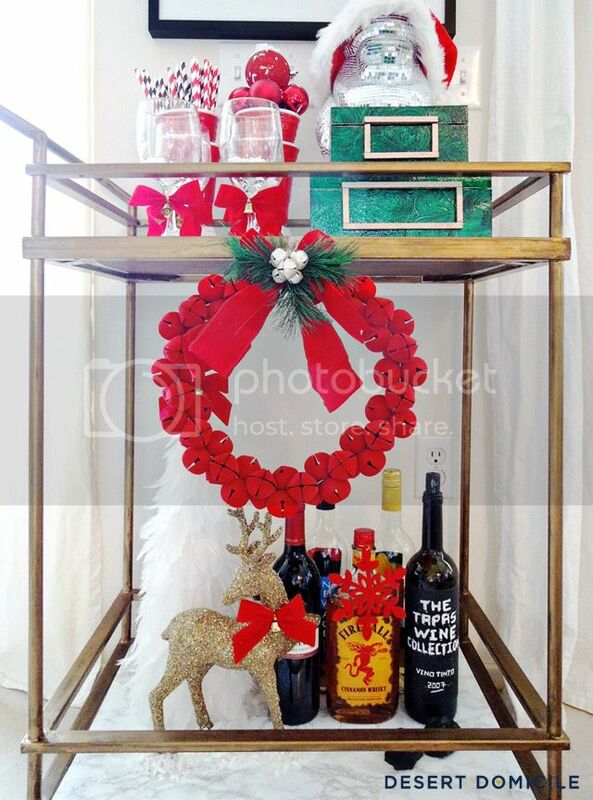 Remember the marble shelves on our holiday bar cart? Well, they're not actually made of marble! 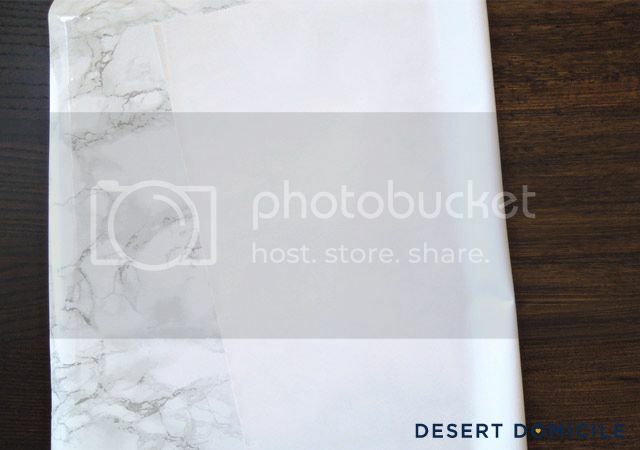 I updated them with my favorite marble contact paper! 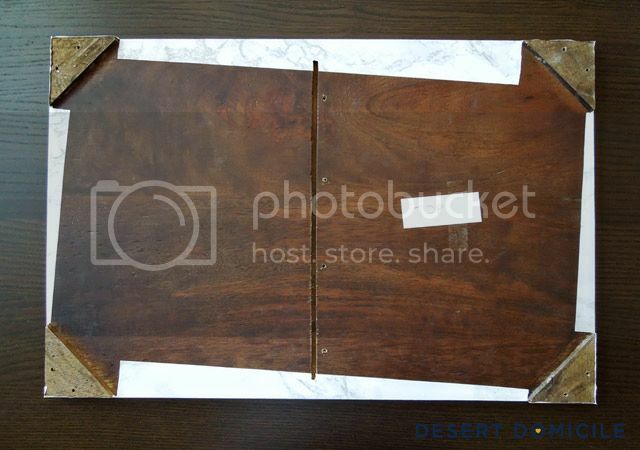 There were four corner brackets on the underside of the shelves. I creased the edge of the paper again and stuck it in place (seen on the right). I cut the paper at the edge of the bracket and smoothed it down as best I could (it didn't want to stick to the rough edges). I cut away any excess and moved onto the next side. I folded the contact paper like a present at the corners. 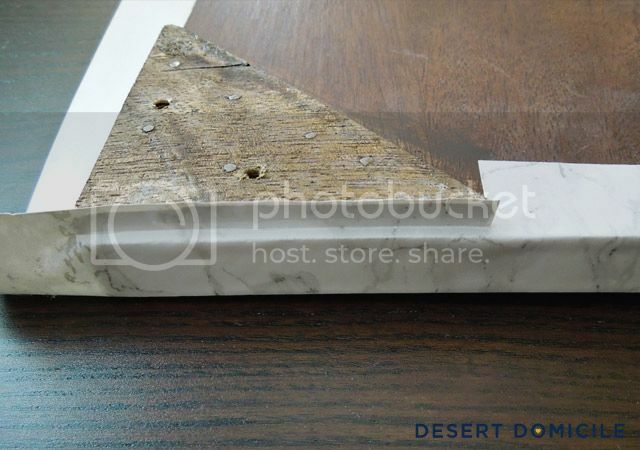 I used an x-acto knife to cut away the excess in the space where a metal piece goes to secure the shelf to the bar cart (the gap in the middle). I gently placed the shelf back in our bar cart and screwed it in place from underneath. One shelf down, one to go! 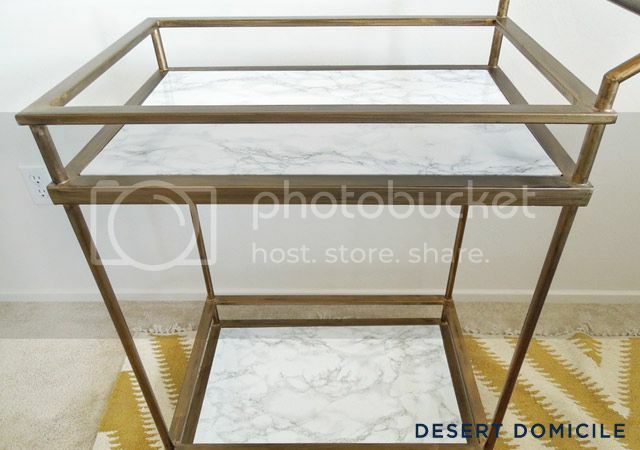 The marble contact paper is really convincing and looks great against the warm brass of the bar cart's frame! 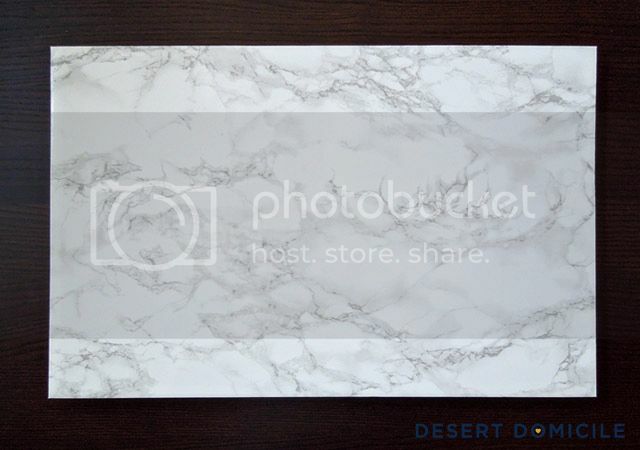 What would you use marble contact paper on? That is so awesome! 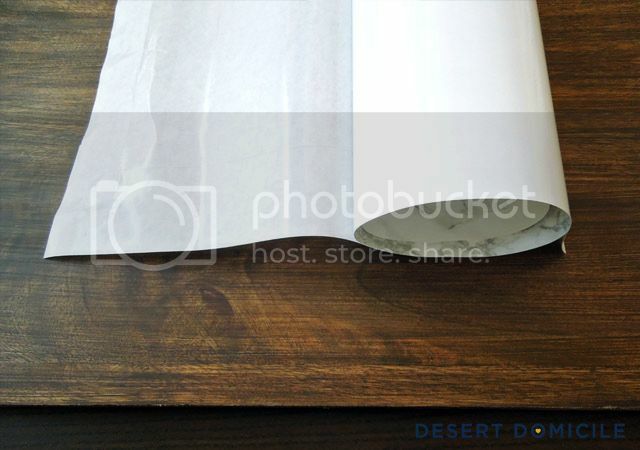 I never thought to use contact paper like that! 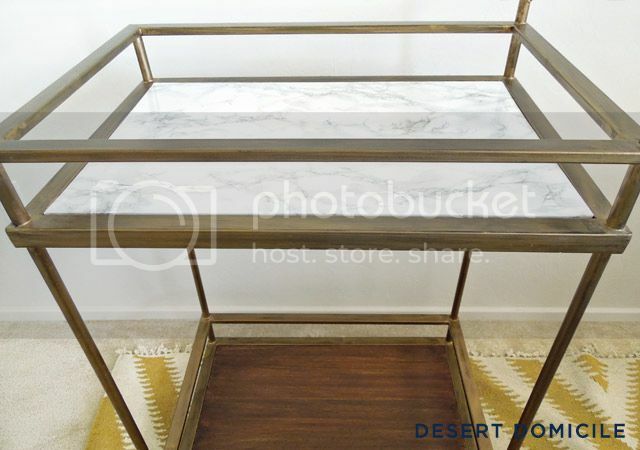 Where did you get the bar cart? 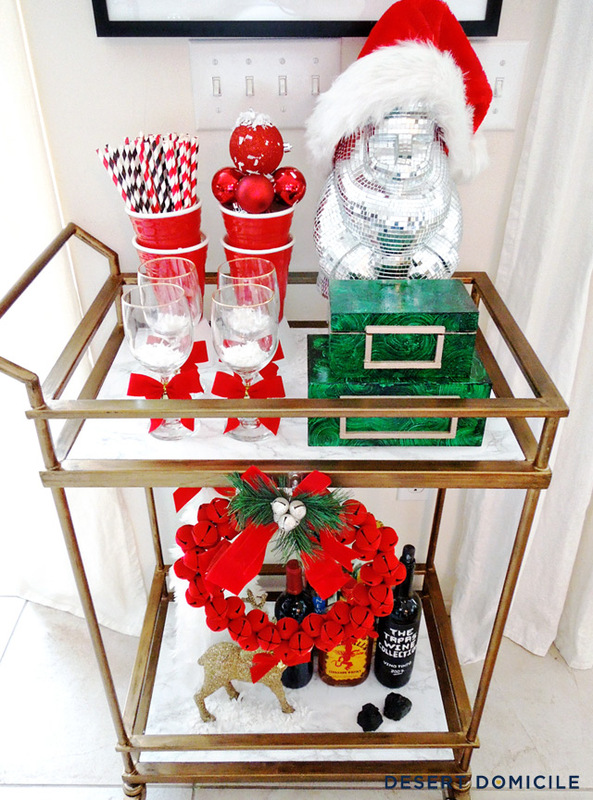 I would be interested in seeing how you use your bar cart in different seasons. Thanks Julia! 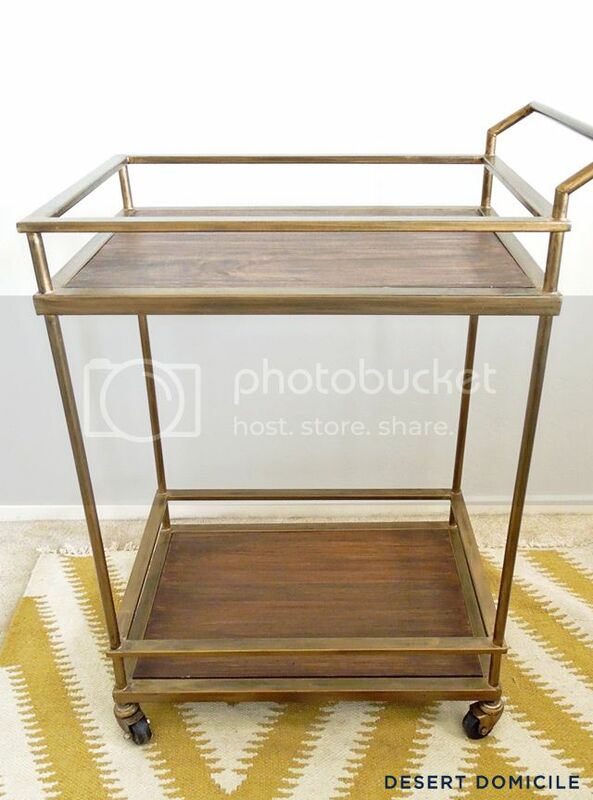 The bar cart is from Target: http://www.target.com/p/threshold-bar-cart-gold/-/A-15417452 and it happens to be on sale right now! Mine is last year's model so my gold frame has a bit of a distressed/brushed finish whereas this year's model has a solid matte gold finish. Looks great!! I just love contact paper!! 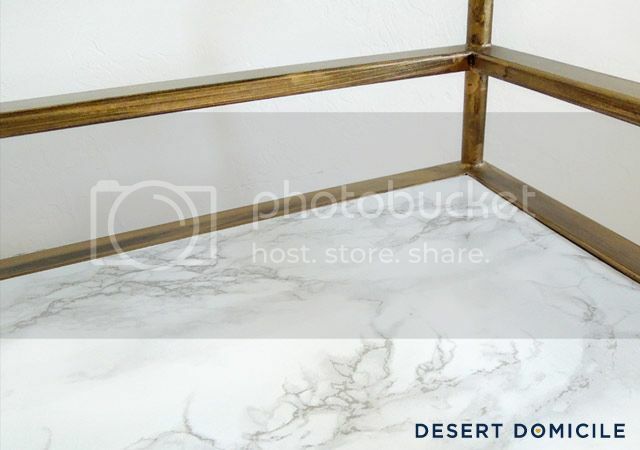 We used it on shelves in the bathroom to makes the marble on the countertop! Love it! 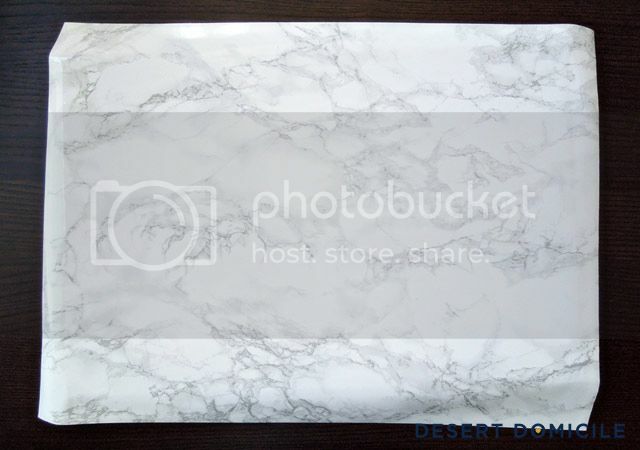 I have some marble contact paper and have found some super cute uses for it. 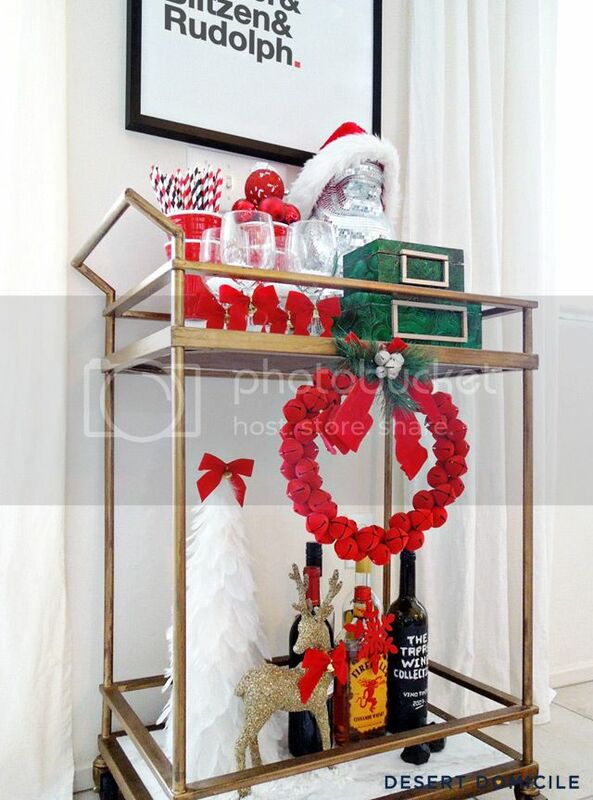 LOVE your bar cart...so festive and fun! Cheers! What a difference! 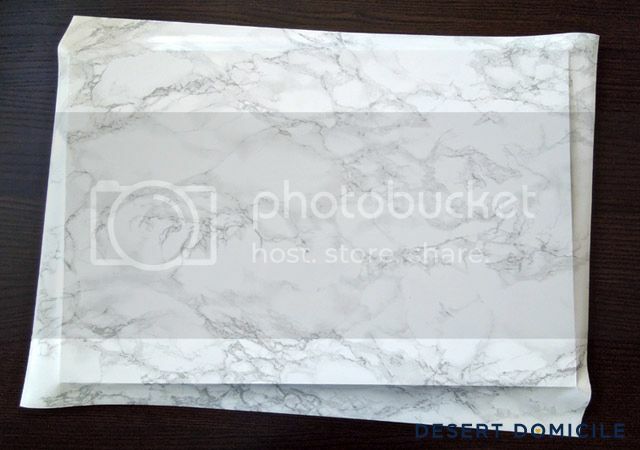 I need some of this contact paper in my life! 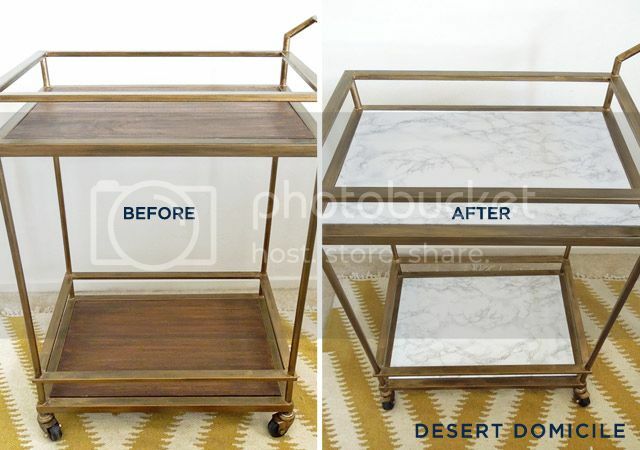 This makes me want to marble-contact-paper all the things! 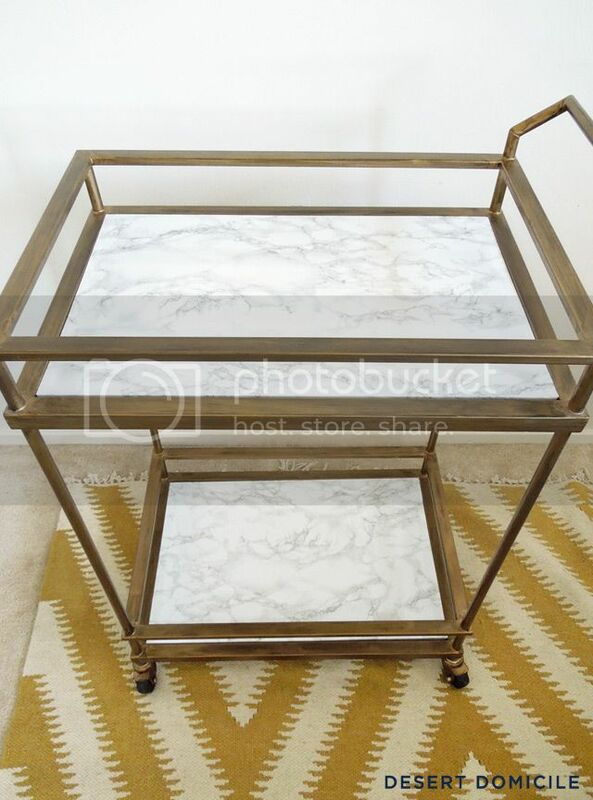 Still swooning over that bar cart. I remember you got it for something ridiculous like $1 (can't remember exactly but that's how much it felt like haha!) Beautiful little hack you did here. 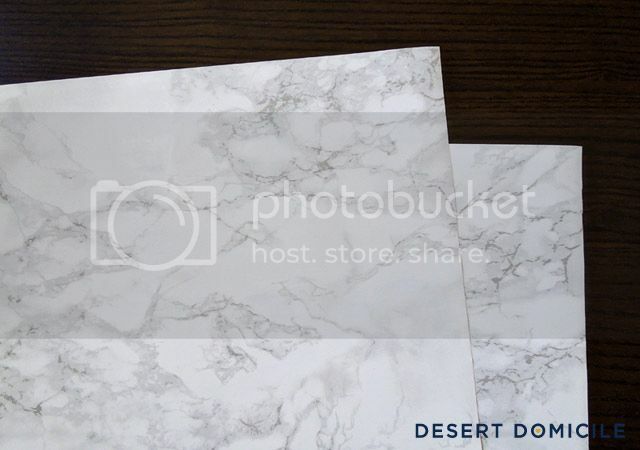 Marble contact paper is one of my favorite things!